One of my personal favorites, Woolly Blue Curls' floral display is both visually stunning and soft to the touch. Interesting-looking purple flowers form alternately on the ends of its stalks. 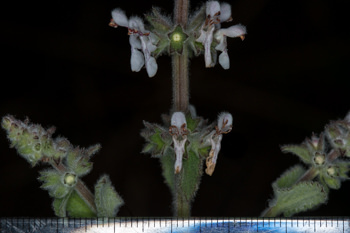 Tiny white hairs cover the various parts of this plant and clearly contribute to its naming, including its scientific names: Trichostema means having hair-like stamens, and lanatum means woolly. 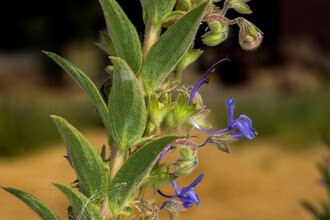 Wooly Blue Curls is a memnber of the Mint family (Lamiaceae) which includes sages (Salvia species), Pitchersages (Lepechinia species) and Wood mints (Stachys species). 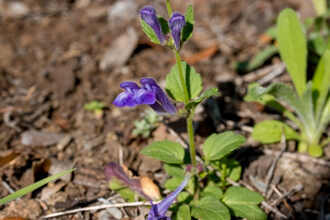 Most Trichostemas are aromatic and have distinctive blue or purple flowers. 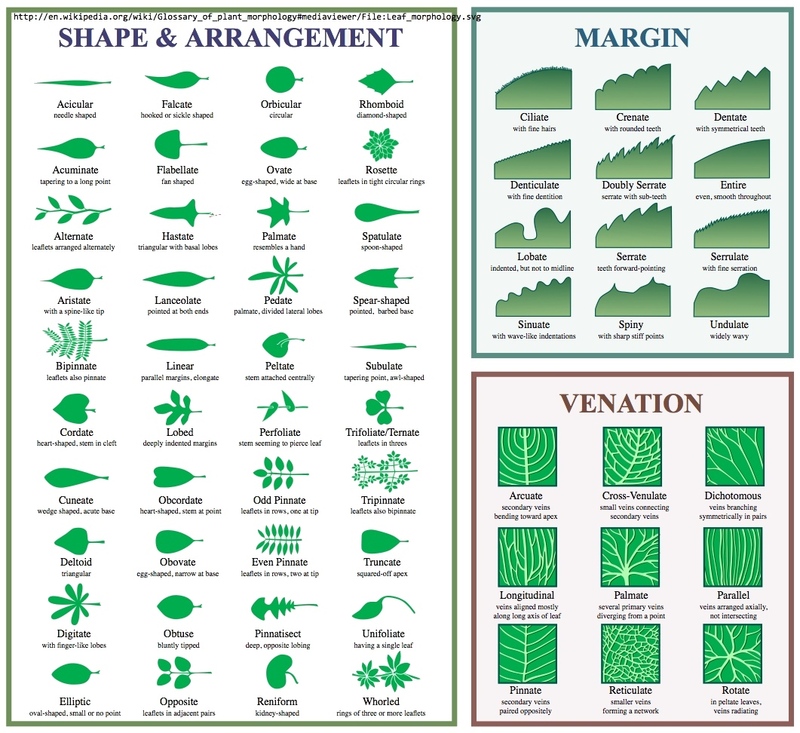 Square stems and opposite leaves are among the shared traits of this family. Woolly Blue Curls blooms from March to August. The color of the flowers ranges from deep purple, through blues and pinks to off-white. 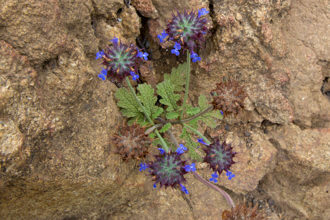 Look at the blooms close-up and you will see the variation in coloring in the different flower parts. 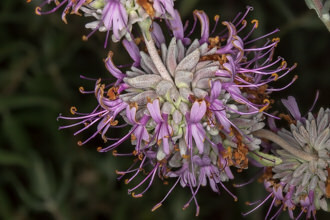 Wooly Blue Curls is an evergreen, perennial sub-shrub, growing 3-5 ft. (1-1.5 m.) tall and 4-6 ft. wide. 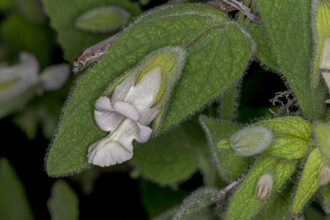 The plants resemble the Mediterranean herb Rosemary. In fact, some common names for this plant are Romero (Spanish or Italian name for Rosemary), California rosemary and American wild rosemary. 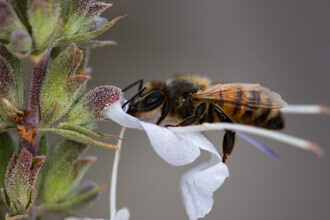 Hummingbirds and bumblebees feast on the pollen. Hummingbirds are the primarily pollinators of this plant. The stamens extend out far from the flower and land on the back of the hummingbird when weight is placed on the lower lips of the corolla. . The shiny, aromatic, narrow green leaves are a pleasant sight when many other plants have turned brown. 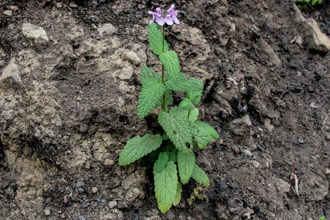 This plant is aromatic - try it yourself and rub the leaves. It is truly a pleasant one; a bit of pine, a hint of lavender, a fresh sweet scent that is unique to Wooly bluecurls. 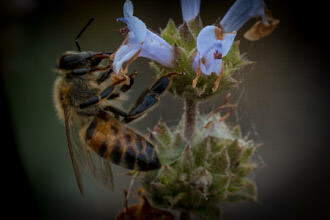 Like many other aromatic plants, Wooly Blue Curls have a long history of culinary and medicinal use. Fire Response: Germinates from seed. 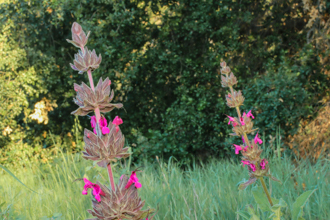 Trichostema lanatum is ‘fire-follower’; seeds require stimulus from chemicals in the smoke of burning Coastal Sage Scrub or Chaparral to germinate. Last modified: March 03 2019 19:17:21.